My favorite Robert Stanek book is The Kingdoms & The Elves of the Reaches III. This is the best of the series! I love Adrina, Emel and Myrial. They are my favorite characters. Xith and Vilmos are great too. On this page I'll include an annotated list of all the books by Robert Stanek. I'll include comments on each and sometimes pictures. It is the first book in Keeper Martin's Tales. It is where the adventure begins. You learn about Adrina, Vilmos and the elves. It is the next book in Keeper Martin's Tales. It starts where the first one ended. The action goes into overdrive! It is why this is the best series ever!!! 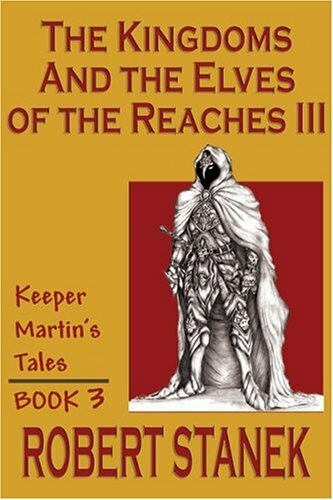 It is the third book in Keeper Martin's Tales. This is WOW! I've read this 4 times! #4 is so completely incredible! OK. I didn't get this at first. Then I was like hooked. It is like getting to read Keeper Martin's Tales all over again but with different things. It is great! One of the best. My favorite is still KE #3 but this is cool too. It is a whole new view of everything with some old. I like it a lot. Oh my gosh! I like it. It is not about elves or magic exactly but it is magical. Ray is reminds me of my brother.